Most people who fly to the Caribbean do so on a major airline like American, Delta, Southwest, JetBlue, or Air Canada. Once you arrive in the Caribbean, however, you're more likely to be taking a small "puddle-jumper" if your itinerary includes more than one island, if you're final destination is a more remote private-island resort, or if you're traveling to one of the smaller outposts of a multiple-island chain like Turks & Caicos, the Grenadines, or the British Virgin Islands. Limited ferry service often means that air travel is your only practical choice for getting to many Caribbean islands. When you're traveling to one of these destinations, don't expect a big plane, either -- or even a jet aircraft, for that matter. Cayman Airways, for example, flies 737 jets between its Caribbean destinations, but the fleet operated by Mustique Airways is more typical: 19-passenger Twin Otter jet-props, 9-passenger Britten Norman Islanders, and 6-passenger Merlyn Commanders. 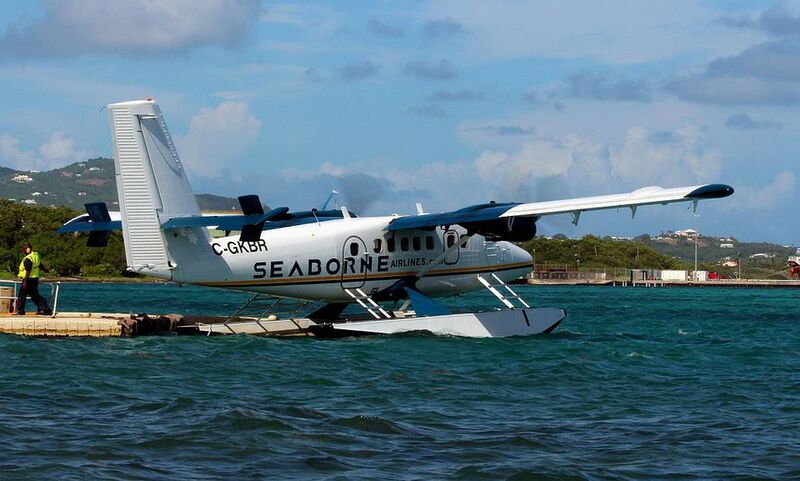 Flying in a plane that size is not necessarily for the faint of heart, but flying low and slow can be part of your Caribbean adventure - especially when you're sitting right behind the pilots or, in the case of Seaborne Airlines, making your island-hop in a seaplane. Bimini in the Bahamas and St. Croix in the U.S. Virgin Islands are just two of the destinations you can reach via seaplane, and it really is a thrill to take off and land on the water. In an era when most air travel has the glamour of riding in a commuter bus, there's still something fun about arriving at your destination by alighting from a seaplane on a floating dock! Destinations: Antigua, Barbados, Dominica, Grenada, Guadeloupe, Guyana, Martinique, Puerto Rico, St., Croix, St. Kitts, St. Maarten, St. Lucia, St. Thomas, St. Vincent, Tortola (BVI), Trinidad. Destinations: Nassau, Bahamas; Montego Bay, Jamaica; Kingston, Jamaica; St. Maarten, Antigua, St. Lucia, Grenada, Trinidad and Tobago, Barbados. Destinations: Cayman Islands; Kingston and Montego Bay, Jamaica; Havana, Cuba; and La Ceiba, Honduras. Destinations: St. Vincent & the Grenadines (St. Vincent, Mustique, Union Island, Canouan, Bequia), Barbados. Destinations: Aruba, Curacao, Bonaire, St. Maarten. Destinations: Puerto Rico (San Juan, Vieques), U.S. Virgin Islands (St. Thomas, St. Croix). Destinations: St. Vincent & the Grenadines (Bequia, Mustique, Canouan, Union Island, Carriacou), Grenada, Barbados. Destinations: Puerto Rico (San Juan, Culebra, Fajardo, Vieques) U.S. Virgin Islands (St. Croix). Destinations: Bahamas (Nassau, Andros, Bimini, Freeport). What Languages Are Spoken in the Caribbean?